Sunshine Window Cleaning can help make the exterior of your house, driveway, sidewalk, deck, fence, and play set look like new again. 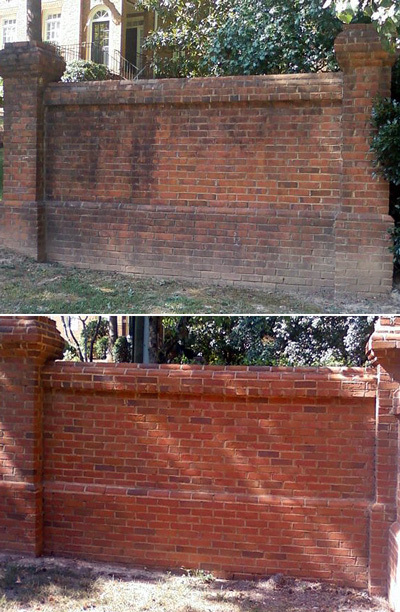 The busiest time for pressure washing in Atlanta is typically after pollen season in order to wash away the film of yellow, but you certainly can wash away the slippery green algae and destructive black mold any time of year. See our pricing page for more information on how to obtain an estimate or request a free, no obligation quote. 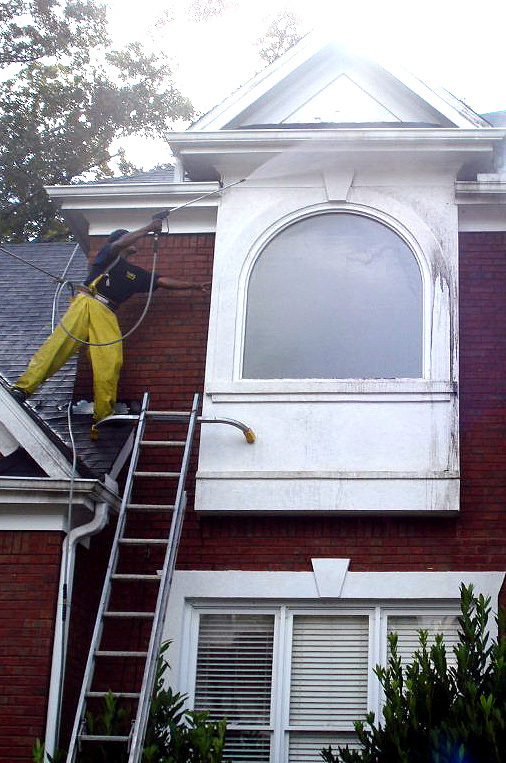 Please view our Atlanta pressure washing services video for details on how your home will be washed. Fence and deck pressure washing follow similar procedures, but keep reading to learn the difference between low and high pressure washing. 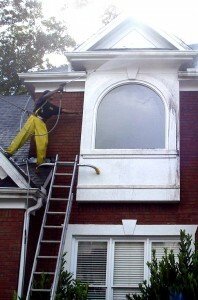 Residential pressure washing for a home could be better described as a soft pressure chemical rinse. To protect your house, very little pressure is used; in fact, it could be compared to the pressure that comes from your garden hose. It is the soapy cleaning solution that actually cleans your home. This procedure is also used on any wooden items like play sets, patio furniture, fences and decks. Pressure washing can also clean any hard exterior surface as well like driveways, patios, rock and stone, pavers, etc., so just ask if you’re unsure. We get results! Look at the black mess coming off this home. We are confident that you will be satisfied with our commercial and residential pressure washing services. To ensure you are happy with the results, we guarantee it. We will not leave your property until you are completely satisfied, and if you’re not available during the appointment, no problem; we will return to make it right. John and Kevin did a great job power washing our deck and walkway. They also made our windows gleam. They were prompt and courteous. I will definitely use them again. Vel and Rob from Sunshine did a pressure-wash and clean of our house, deck, patios and driveway. Simply outstanding job. Got every nook and cranny and the house looks new. Very professional, thorough and informative about future maintenance to make it last. Definitely will use this service again. They can use us as a reference any time. Sunshine came to our home June 29 in the afternoon to pressure wash. They did our 3 story house and corner sidewalk and they did a superior job!!! No complaints at all. They were polite and friendly and fast. We have used a variety of pressure washers, but Sunshine is the best. Thanks so much. Twice Sunshine Window Cleaning came to my rescue! Alex and Candido are incredibly professional and their work is superb. I already gave out Sunshine’s information to my homeowners association members, and I won’t hesitate to recommend this wonderful team again! Thank you for all of your great, hard work. The house looks like its just been painted and its spotless! and clean gutters. Great customer service and looks GREAT!!! We have had our house pressure washed by other companies before but your company was referred by a friend so we thought we would check it out. I am so glad we did. Our experience with John and Alfredo this morning was fantastic. They were both professional, friendly and took the time to talk through other options such as cleaning out the gutters etc. We will definitely use Sunshine Window Cleaning again. Thank you for making the house look good! I am so happy with Sunshine Cleaning and their amazing staff! Buka and Gustafo pressure washed my entire house this afternoon and it has never looked better! I have recommended Sunshine before and will continue to do so. I am your biggest fan! I’ve used Sunshine. They power washed my house; they were absolutely fantastic. What I liked about them is that their price was very, very good, and the workers came out and told me exactly what to expect. They did such good work that people thought I had painted the house. The team form Sunshine Window Cleaning came to my house Saturday and did an outstanding job of pressure washing my driveway, front and back porches, and brick and stone walls. I was completely impressed with the quality of work, professionalism of the team, and the price was fantastic. I will certainly use and recommend Sunshine Window Cleaning in the future.